November 11, 2018, 7:34 PM · Southwestern Virginia has lost a fine man and a fine luthier. Daniel Foster died on October 20, 2018, surrounded by his family. He will be remembered as a man of faith, beloved husband, father, grandfather and friend. Luthier and cellist Daniel Foster. 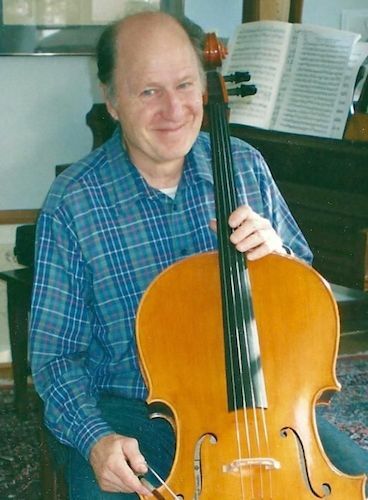 Daniel also leaves behind a legacy of violins, violas and cellos created, in Dan's words, “to the Glory of God.” In his lifetime he made hundreds of instruments. Some of them received awards, and I believe his highest award (for one of his violas) was a VSA Silver Medal for tone. There is a nice video (about 3 min) about Dan working in his shop. The young woman playing Dan's cello in the video is a local student, credited at the end of the video, Miriam Liske-Doorandish, who is now studying the cello at Oberlin -- with her Foster cello. Miriam's mother Lisa Liske-Doorandish is a performing professional cellist who is also my daughter's cello teacher. In the video Dan said that he couldn't imagine what else he'd do in retirement except continue to make instruments. Unfortunately Dan had to close his shop a few years ago because of failing health, but I saw him at recitals from time to time, most recently in September or so. I can't conclude this brief obituary without recalling a funny story -- one that takes on a bittersweet tone now. Several years ago I was looking for a new violin, and I had brought a few home from shops in Richmond and taken temporary possession of a few in the collection of a local pro. I often visited Dan's shop, which was in his home on Harding Avenue in Blacksburg, so I popped in to see if he had a violin that I could add to the mix. Sure enough, he had an instrument that he had made a few years before. I tested it, and it had a beautiful, singing treble voice and an orange varnish (one of Dan's trademarks) that I rather liked. In the end, the violin wasn't quite what I was looking for, so I brought it back to Dan's shop. I told Dan that I was feeling a little put off by his asking price, not that $18,000 isn't reasonable for a well-made violin. Dan looked at me and grinned, and he said, "You know, Paul, it'll be worth twice as much after I die." November 12, 2018 at 04:12 PM · Truly sad to see such wonderful souls pass to the other side. November 12, 2018 at 04:35 PM · A great tribute, Paul! Thanks for writing this.